so in spirit we may refrain from sin. The Station today is at St. Lawrence’s in Lucina. Near the church was a well which was very dear to the Romans and which probably suggested the Epistle and Gospel of today’s Mass. The church also contains a part of the gridiron on which St. Laurence was burned. The Introit and Gradual refer to the prayers of the Saint while he was being tortured. 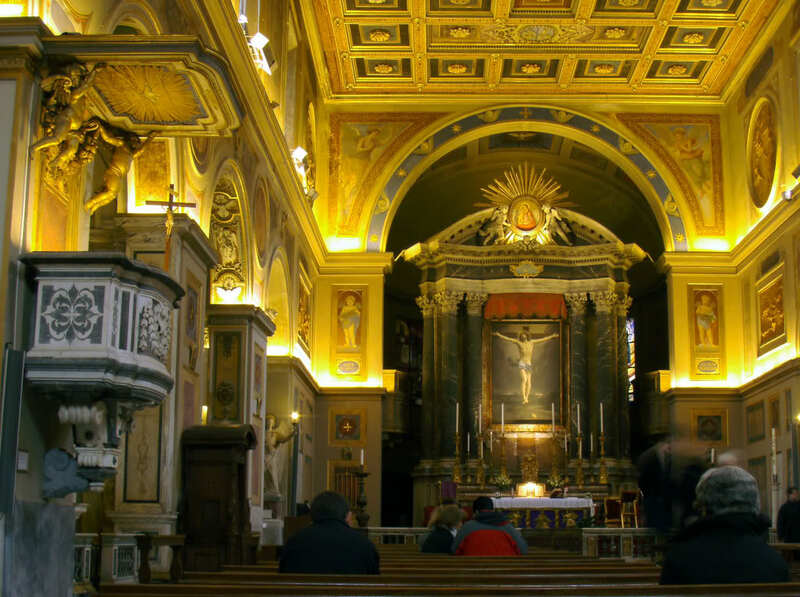 The Collecta today is at St. Mary ad Martyres which is the name given to the beautiful Pantheon of Agrippa when it was turned into a Christian Church by Pope Boniface IV (608-15). The Romans of the Middle Ages loved this majestic sanctuary, where among other relics was preserved in a casket locked with thirteen keys the image of the Holy Face. Known as the apostolorum discipula, Lucina is usually presented as a pious woman dedicated to works of charity towards all Christians in general and towards martyrs in particular. In fact, she is said to have cared for the burial of the martyr-saints Sebastian, Faustinus, Simplicius and Beatrice, Cyriacus, Largus and Smaragdus, and Pope Marcellus. Some of these attributions, however, must be mistaken since it would mean that she lived over a span of 200 years! There may, therefore, have been more than one lady named Lucina who exercised these acts of charity towards the martyrs. The church was originally a fourth-century oratory, and was enlarged into a church in the fifth century. When it was destroyed by Robert Guiscard in 1084, Paschal II (1099-1118) rebuilt it. It was modernized in the seventeenth century by Pope St. Pius V.
Note Paschal’s delicate campanile and austere façade and porch. In the first chapel on the right is Lawrence’s gridiron. The fourth chapel on the right was designed by Bernini for Innocent X’s doctor, Gabriele Fonseca. Bernini also executed the bust of the good doctor. In the thirteenth century, the church was titular of Hugh of Evesham, author of Canones Medicinales, who was created cardinal by Martin IV (1281-1285) and summoned to Italy not only to act as his physician but also to rid Rome of malaria. (Sadly, Hugh himself succumbed to the dreaded Roman fever a few years after his arrival.) Over the high altar is Guido Reni’s Crucifixion, a masterpiece of religious art, and in the choir is Paschal’s beautiful episcopal throne. The station here was formally erected by Gregory the Great.